The blockchain has the potential to enable the collaboration between patients, researchers, and care providers to provide individualised care for patients, but how can this technology be harnessed in a practical way? This was one of the key questions that was asked at the Blockchain in Healthcare Congress and we had the pleasure of welcoming an array of expert speakers from pharma, academia, and industry to provide the answer. 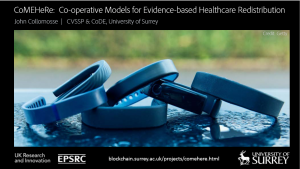 If you weren’t able to attend the Blockchain in Healthcare Congress to watch these presentations, please enjoy these free case studies from Aji Barot and Disa Lee Choun and John Collomosse to see the application of blockchain technology using real-world examples. 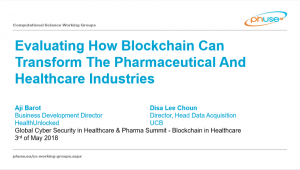 Aji Barot and Disa Lee Choun discuss their collaboration with 17 companies across the industry, understanding the landscape in the pharma and healthcare, and exploring the areas where Blockchain could be used. In these slides, they will also present two detailed case studies, focusing on smart contracts and a Distributed Asset Ledger to support future development and implementation for proof of concept. CoMEHeRe is a two year UKRI/EPSRC funded project that aims to transform personal healthcare through the design and evaluation of new technologies and business models for commodifying and brokering casually captured personal healthcare data (e.g. from wearable biosensors and the IoT) to state and private healthcare providers. 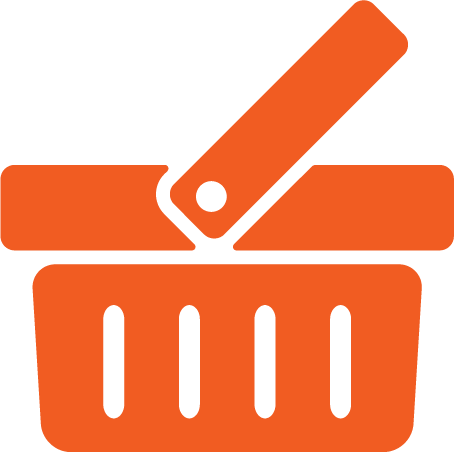 In this presentation, John Collomosse will provide a broad picture of the CoMEHeRe project, and describe a prototype of the platform and campus-based user trial delivered across the project’s initial six months. If you would like to learn more about the latest developments in blockchain technology, we think you’ll enjoy these articles.